I just received a can of boiled peanuts. What do I do with them? No recipe, just a question. Eat them! You have a few options. Since they are already boiled and canned, they are safe to eat right out of the can. If you like your boiled peanuts hot you can reheat them before eating them. You can either reheat them in the same juice from the can, or you can dump that juice and reheat them in salt water. Use about 1 tablespoon of salt per pint of water. You don't need to bring the salt water to a boil, just simmer them until the peanuts are the temperature that you like. 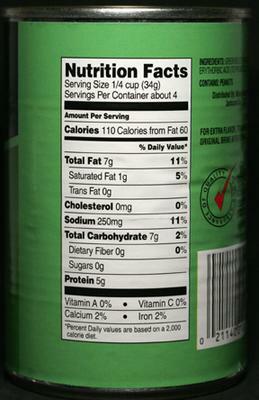 Commercially canned peanuts have Erythorbic Acid included as a food preservative in addition to the salt and water. I find that this adds a tart, sour taste to the peanuts. 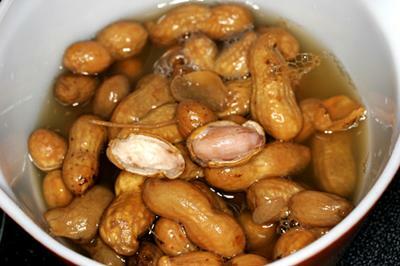 If you don't like that taste you can soak the canned boiled peanuts in plain water, replacing the water several times. Then you reheat them in new salt water. I don't think you will be able to fully remove the tartness, but soaking will diminish it. You may like the tartness. I personally don't like canned boiled peanuts nearly as much as fresh or frozen boiled peanuts, but they are better than having no boiled peanuts when you have a craving. 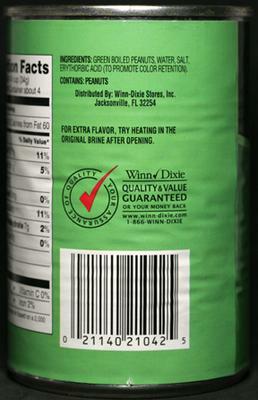 I posted a few pictures of canned Winn Dixie green boiled peanuts. What to do with boiled peanuts? 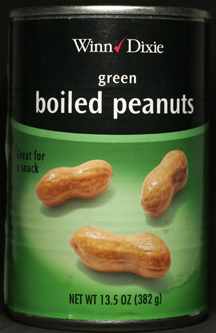 I've heard of boiled peanuts for years, and when I saw a can of them, I had to try them. I was stunned to find they were "boiled" in some sort of hot salsa, and when I did as instructed, they were extremely MUSHY. I eat peanuts for crunch, and was shocked to find they were very mushy. In regards to the woman who was bewildered by the fact that boiled peanuts would not be crunchy...what? Have you never boiled anything before in your life? Common sense clearly is not common. I was just wondering how long they really last.